A new opinion poll puts Greece's ruling conservatives neck-and-neck with the radical left opposition. The poll, conducted by Marc for Alpha television station, gives New Democracy 28.2 percent of the popular vote if elections were conducted tomorrow, roughly its election victory margin of 29 percent last June; but Syriza is just a hair away at 27.9 percent. What ought to trouble the conservatives is that their success in claiming 52 billion euros' worth of bailout loans on paper last December, and the disbursement of 34 billion of that in fact, has not yet had an effect on the electorate's mood. Prime Minister Antonis Samaras has bet his political future on the successful execution of an unpopular austerity programme, to leverage financial and political benefits out of his European Union partners. c) almost a doubling of the far right Golden Dawn's showing of seven percent in the last election, suggesting that many Greeks (if not the mainstream) are indifferent to, or ignorant of, the rise in racist attacks in Greece. 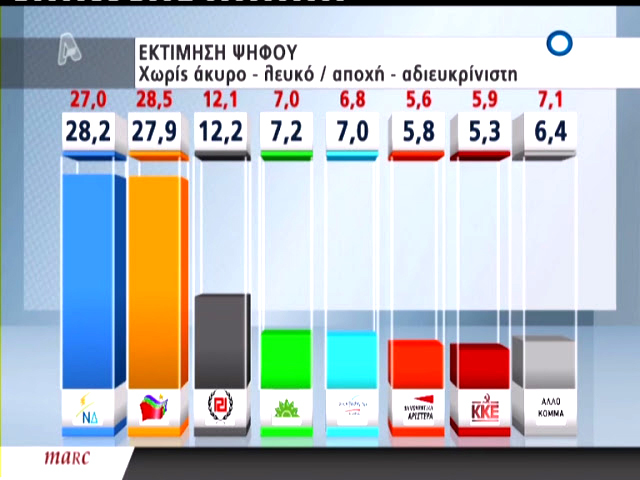 Golden Dawn comes in third with 12.2 percent, beating both the socialists and leftists who share power with the conservatives.